Maximum Read Speed 33 MB/sec. Maximum Write Speed 31 MB/sec. 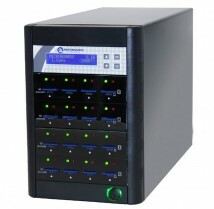 Throughput Capacity, 1 GB SD Card 7-Slot: 490/hr. - This firmware update applies only to serial numbers beginning with "V". It adds the asynchronous duplication feature. See the latest User's Manual v2.3 for details. * Do not update to this revision if your Flash Duplicator is currently at U.15 or below - Contact technical support for assistance. - Instructions: Copy the contents of the zip file onto a flash drive and insert it into the reader port. Then use the Firmware Update menu item under Utilities.